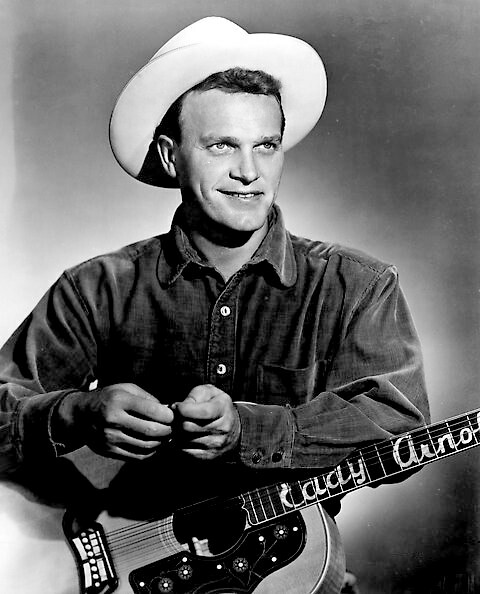 Eddy Arnold, "The Tennessee Plowboy, was a cowboy singer with a powerful set of lungs. After enduring a tough childhood, the death of his father at eleven and living and working in a funeral parlor to support himself, Eddy found himself at the height of country and western fame. In 1940, Eddy began working with Pee Wee King in the Golden West Cowboys. With the group, he made regular appearances on the Grand Ole Opry. Colonel Tom Parker, later Elvis' manager, snapped Eddy up as one of his first clients. Eddy had his own radio program in 1943, and later again in the 1950s. He found himself at the height of his career in the late 1940s. In a period of just 14 months between 1947 and 1949 Eddy had six number one songs. In the latter part of 1948, he had six hit songs on the top ten at once. After being inducted into the Country Music Hall of Fame in 1966, Eddy generously donated many of his flashy costumes and memorabilia to them. So slip on your boots and start your toes tappin' because Eddy's in town and he's belting them out with gusto! 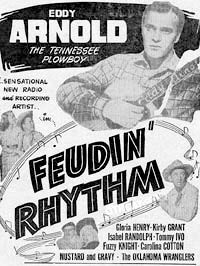 See also Eddy Arnold in Checkboard Fun Fest and Eddy Arnold Social Security Show. The discs arrived on Thursday. Thank you! A lot of good shows to look forward to. Long time no talk. I'm still here loving old time radio -- and always will! It's really my fave form of entertainment. Like the saying goes "the pictures are in your head." So true. So cool. Anyway yours is one of my favorite websites. Love the huge selection (wow!) of shows, the old photos, ads and that we get to play samples of the shows. I've said it before and I'll say it again: we appreciate you!!! Thanks for being there! Hope all is well with you and radio cat. Will be ordering more shows soon I promise. Hey you can never have too many right?! Take care my friend.